Lady Liberty's new address: the d'Orsay Museum. Happy Independence Day! If you're planning a July 4th trip to New York City to see Lady Liberty, don't worry! She's still there. But if you're planning to visit her little sister in the Luxembourg Garden in Paris, you'll have to change your plans and go the d'Orsay Museum, which is where she has taken up residence for the foreseeable future. After posting photos of the different Statues of Liberty that I had found in various locations around Paris and posing the question, "How many Statues of Liberty are there?" last December, readers with an impressive knowledge of the city told me to make haste and go to the Luxembourg Gardens. So, I did - only to discover that someone had stolen Lady Liberty's torch, making it a fairly dire situation for a statue that is supposed to enlighten the world. Fortunately, the American Friends of the d'Orsay Museum had already started raising funds to restore the sculpture, which had been exposed to years of pollution, weather elements, and recent vandalism. But before they could move her, the French Senate had to vote on her relocation because they had ordered the smaller bronze version of Liberty to be cast in 1889 to honor the Centennial of the French Revolution and the 9-feet tall statue has stood in the Luxembourg Gardens, the home of the French Senate, for over 100 years. 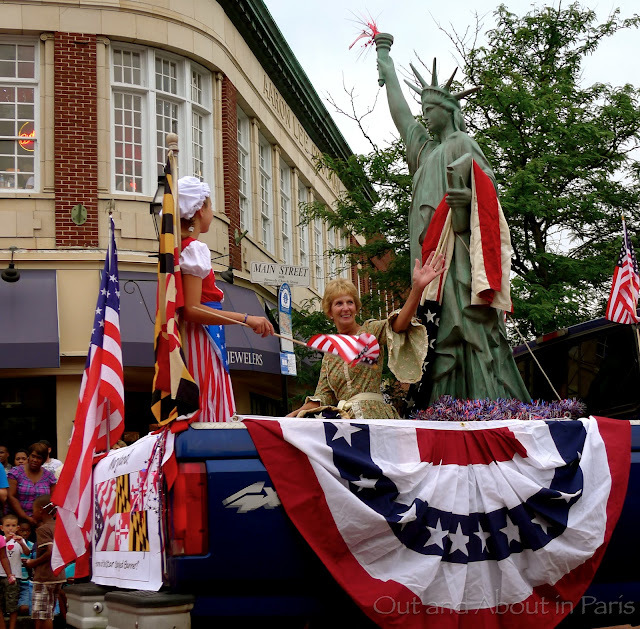 Another Lady Liberty riding on a float during the 2011 Independence Day parade in Annapolis. ..and a happy independence day to you Mary Kay and all my other American friends. I never know there were more than one statue of Liberty in Paris...you learn something every day! Thanks, Denise, for the Happy Independence Day wishes! Now that you know that there is more than one Statue of Liberty in Paris, I'm fairly sure that you'll notice some of the others. And Happy 4th of July to you! I'm having Storsh parade around our flat to John Philip Sousa today. Next year we'll start him on Deviled Eggs and picnic pomp! As for your Lady Liberty search across Paris what a great entry that was. And I'm glad the Luxembourg one is safely in the hands of the d'Orsay, who will (and have) take care of all of the grooming she needs! It sounds as if you had a marvelous day! Yes, it was a good one, thank you! And why not ask your kids to parade around to a booming Sousa -- although perhaps have them avoid walking across the bed to save the springs! As per your conversation with Sylvia you've added something I hope I remember to do in the 4ths to come -- to read Storsh the Declaration of Independence each year. Jane, I'm really pleased that I was able to hear more about your experiences at Omaha Beach during our get together at Café de Flore yesterday. It sounds as if it was a truly memorable 4th of July...even if you did eat a baguette instead of a hamburger or hotdog fresh off the grill! I also only found very recently, that there was more than one Liberty Lady in Paris,I guess they really like her!! I had the same thoughts as you, Sylvia, when I read the first sentence of the Declaration of Independence. We've come so far...but we still have such a long way to go. When we did a guided visit of the Musée des Arts et Métiers, I was surprised by how much the French people on the tour knew about the Statue of Liberty. Not only is she a symbol of independence, but she's also a symbol of the long relationship between the French and Americans. Yes, she is a symbol of the long relationship between France and America. Have you been to the Picpus cemetery? It's small and the hours are limited, but Lafayette was buried there (along with some Americans), and more than one Frenchman has recommended I go to pay hommage to my compatriots and Lafayette (which I've done - and guess I'm passing along). Thank you! I have seeing her at the garden on my itinerary and now know to cross that off and go to d'Orsay! You're welcome! If you have time, you can always visit some of the other Statues of Liberty around town, too!